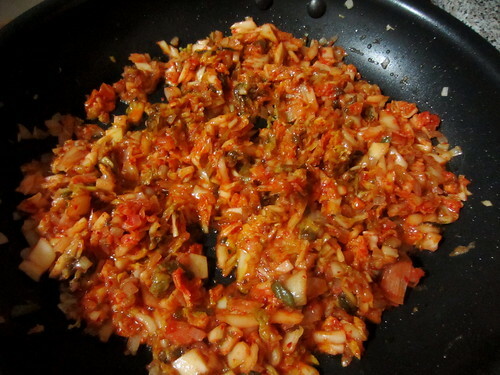 I have, in my long life, come across recipes for kimchi fried rice many times. It never seemed remotely appealing. I don’t like kimchi: it’s too cold, sour, spicy, lip-puckering, shriveling. It always comes before something better, something I want much more. But when I came across it on Pink Basil, it suddenly looked perfect—red, hot. Full of onion and chewiness and oil; I thought it would be cooling. And I anticipated a week or two of Pantry Staples because of various traveling. So I bought kimchi (which totally destroyed my $5 rule—that I can’t buy any single thing that costs more than $5, ingredients-wise; this rule is frequently destroyed, most recently by CHERRIES), and it sat in my fridge for a while. 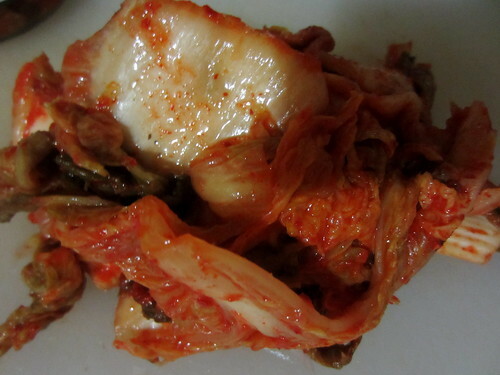 Kimchi, if you are not aware, is basically fermented cabbage. It is also very good for you, in a yogurt sort of way, if you catch my meaning. The brand I bought—no idea what the name is; it just says “New York Kimchi” and then some things in Korean—contains cabbage, apple, salt, ginger, garlic, green onion, anchovy broth (SURPRISE! not vegetarian! ), pepper, chile powder, and some sort of bacteria that’s put there on purpose. Today I finally made the fried rice. I have purchased a new friend. His name is Mofo, Do Not Rob Me Or You Will Regret It. I will keep him under my pillow. This reminds me of an Eddie Izzard bit, but I cannot find it on YouTube. “Glang Gling Gling Gling … Gling Gling.” That was a barrel organ version of “Jerusalem,” which was a British, a British Empire type song. It’s a hymn, you know, one that we’d sing in church as a kid, I used to [sings] “And did those feet Boom Boom Boom Boom in …” you know. And it’s got really weird lines in it, and it was “And shall my sword sleep in my hand.” Not a good idea. You’re gonna roll over and cut your bits off, aren’t you. And then it’s that Godfather scene of [holding things to his face] “Uhh, Uhh, Uhh, Uhh, a head of a horse, and my willy.” “Should my sword sleep near my bed, but not too close so it cuts my bits off.” That’s how the line should go. So. I used it to dice my onion in very very very small and beautiful pieces. I also cut myself in a very precise and accurate (and unintentional, don’t worry) way. It is a very small, painful slice in the top of one of my fingers. It basically just got the skin and nothing else. 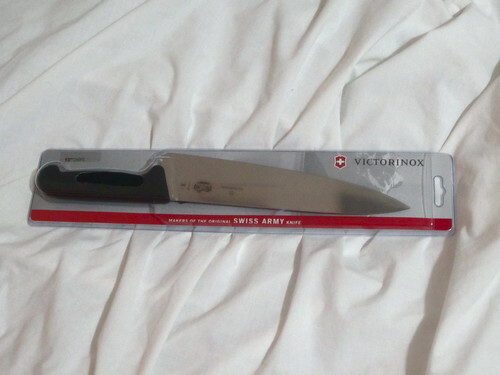 That’s how awesome this knife is. Then I chopped the kimchi—I just put a handful of it on the cutting board and cut it in one direction, and then turned the cutting board 180 degrees and cut it in the other direction, so it ended up in medium dice. Officer, quick! There’s been a murder! It was after eight-thirty and so hot out I wasn’t really hungry, so I ended up just staring at the onions while they cooked, not even really smelling them: the bubbles continually popping to the surface. And then I determined that they were soft enough and threw in some garlic and moved on with my life. Then I put it all in a bowl and fried an egg, and then I was done. 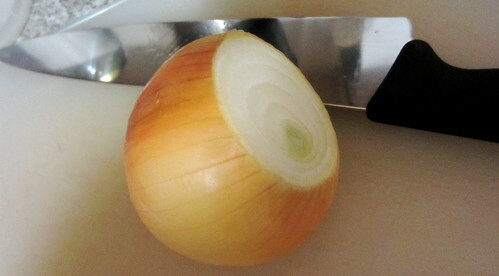 Heat the oil and then add the onion; cook until soft. 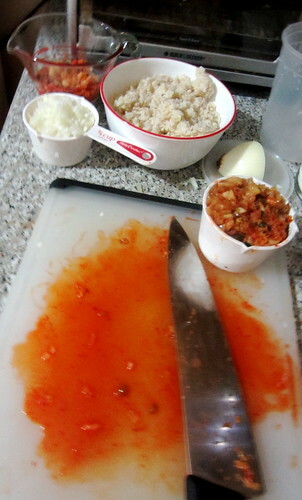 Add the garlic and continue cooking until the onion is beginning to brown. (This is a bit dicey. I don’t know if it’s started to brown until it’s already really brown. But use your judgment.) Add the kimchi and cook until it’s beginning to frizzle; then add the rice, soy sauce, and sesame oil, and cook until the rice is warm and, preferably, a bit toasted. Remove from the pan and fry your eggs, as desired. Mine was extremely cooked through, unlike Pink Basil’s. Also, I should have made two. I am still hungry. Oh, and then if you bought scallions, slice them and put them on top. P.S. Fitzpatrick is OK. I don’t know where he is at the moment, but he is healthy. And very, very large. 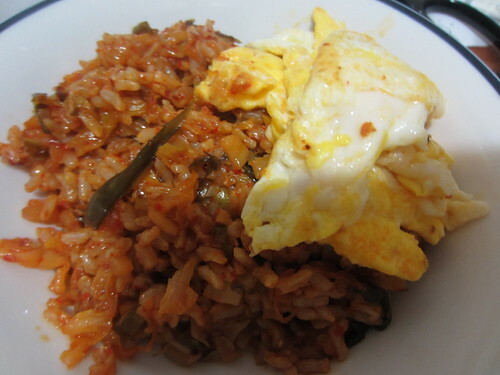 This entry was posted in Dinner, Pantry Staples and tagged Asian, egg, fried rice, kimchi, korean, sesame oil, surprise! not vegetarian. Bookmark the permalink. I think I can never go to Japan because there will be fish in various forms in everything I eat. This looks delicious though. I want to know more about kimchi. I see now that Kimchi is Korean. good thing i decided to do some learning today.